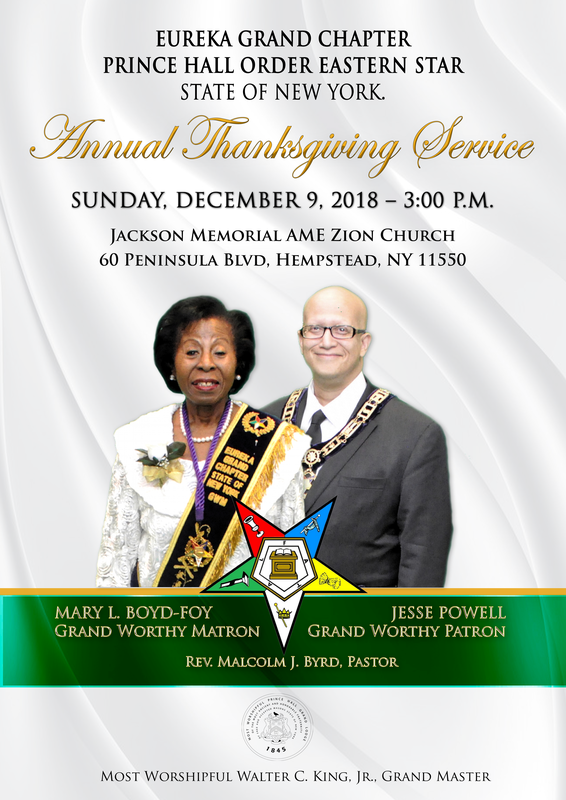 The Annual Thanksgiving Service of Eureka Grand Chapter Prince Hall Order Eastern Star, State of New York will be held on Sunday, December 9, 2018 at Jackson Memorial AME Zion Church, 60 Peninsula Blvd, Hempstead, New York 11550. Rev. Malcolm Byrd, Pastor, assemble at 2:30p.m. in Sermon Attire: Short white (below the knees standing or sitting) white shoes, gloves, hose, jewelry, appropriate fez, single artificial red rose (no green leaves).